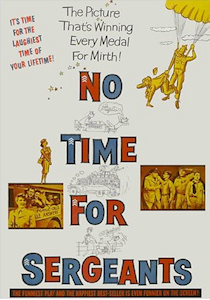 There isn’t too much else to say about “No Time for Sergeants” other than how effective it is through its simplicity of putting a uncultured yet well-meaning baffoon in the care of an orderly sergeant that is prone to emotional outbursts when things don’t go his way. The film doesn’t have an overly profound statement or message about the air force, nor does it berate the military. Instead, it presents a ridiculous situation and rolls with every ludicrious moment like it was a war using pies. This is just a simple yet fun ride that brought a smile to my film-loving face.